You can watch Mad Men Season 7 Episode 8 online via TV Fanatic. We have many different viewing options available for you to do so, so watch Mad Men online now. When you watch Mad Men Season 7 Episode 8 online via TV Fanatic, you'll discover the promise of money is not always enough to make people happy. For all of the excitement at millions and a new partnership, nobody seems all that excited to be in their positions at the moment. Don Draper and Roger Sterling are back to womanizing and neither is living the dream. Joan doens't feel any more powerful than she did before, and if anything she may feel worse. 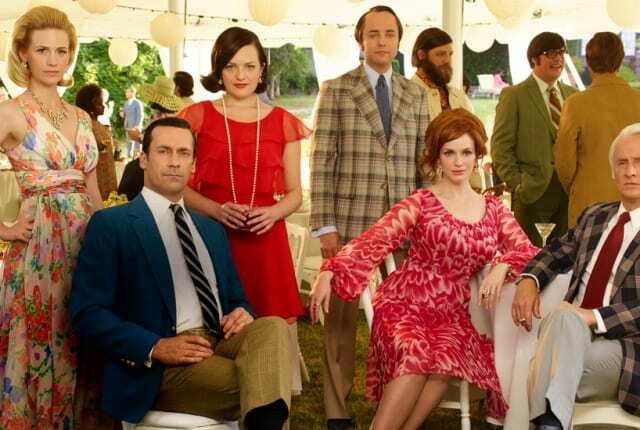 Find out all about it when you watch Mad Men online via TV Fanatic. On Mad Men Season 7 Episode 8, Don attempts to track down a friend; Joan struggles to solve a problem with an account and Peggy is set up by an unlikely individual. Don: You're not just smooth. You're Wilkinson smooth. Permalink: You're not just smooth. You're Wilkinson smooth. Permalink: Hanes calls them Leggs.